Here is one of the rarest artifacts I have ever offered and I hope some collector will appreciate it as such. This is a great historic American and Colt rarity that deserves someone to step up and have it restored. 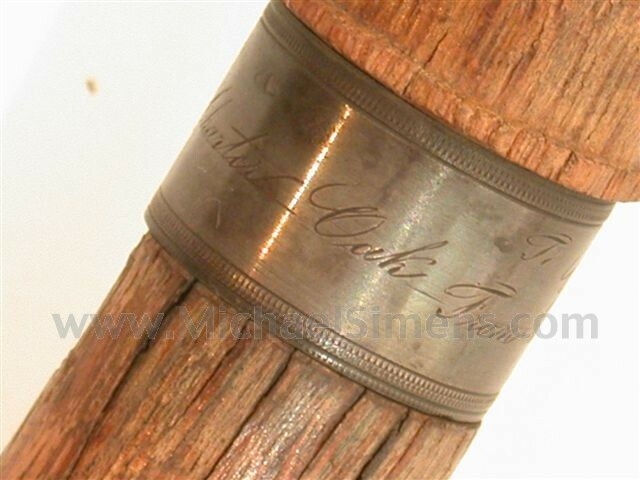 This cane was presented to General Caleb Cushing, a soldier, diplomat and politician during the 1840's - 1870's period. It was presented by the Democrats of Colt's Patent Firearms Company. 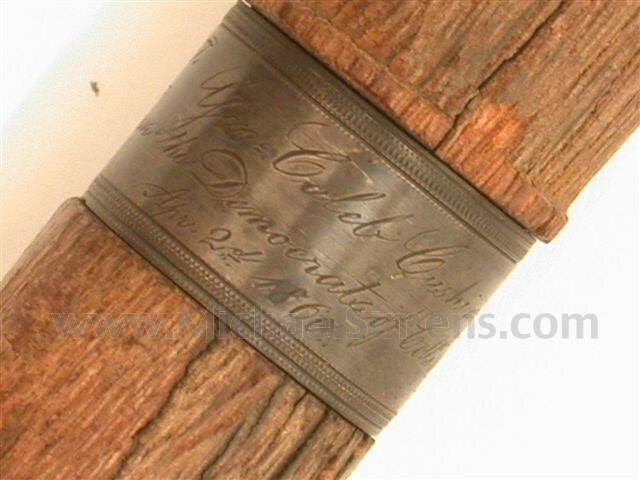 It is fashioned from the famed "CHARTER OAK " and is so inscribed on one of its silver bands. 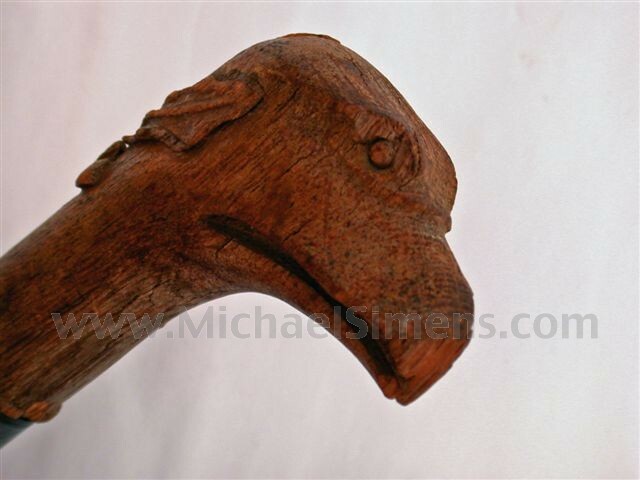 The handle of the cane is carved in the form of an American Eagle's Head and the shaft is roughly 40" long. It is currently in 3 pieces and the shaft shows weathering and poor storage. Cushing served in the Massachusetts Legislature, served in Congress, served as a Colonel and Brigadier General in the Mexican War, and held high government offices. In 1843 President Tyler nominated Cushing for U.S. Secretary of the Treasury but he was not confirmed. He was appointed commissioner and United States Ambassador to China in 1843. He served as Attorney General in Franklin Pierce's Cabinet, presided over the Democratic National Convention in 1860 and was nominated for the Supreme Court in 1874. Cushing led an exciting life in one of the most exciting periods in American History. Any presentation by Colt, his workers or representatives of his establishment is rare and collectible. A presentation fashioned from the famed "Charter Oak" is almost impossible to find, and to additionally be presented to such a famous individual makes this cane a highly prized artifact. 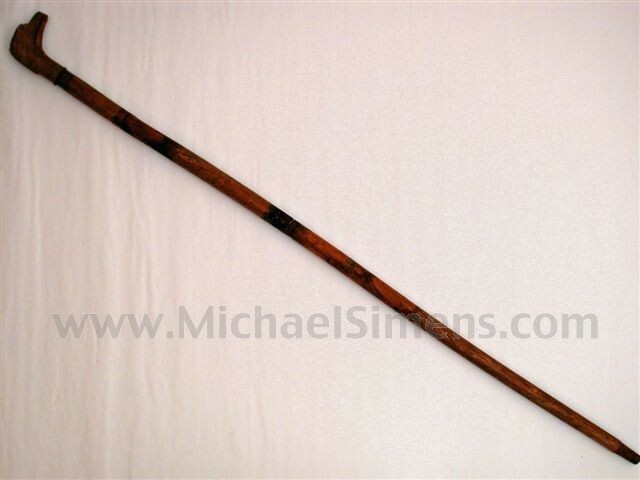 I think this price is quite reasonable and would note that there are 4 or 5 of these canes that were presented at the same time and one is pictured on the net as sold at auction. A restoration based on photos and specifications of the other cane is in order, and can probably be arrainged for the buyer of this rare Colt Presentation.